General search area: From the Covington Flats area northeast towards Quail Wash.
A fundamental mystery of this event is how Bill’s cell phone could have registered a ping at a distance of 10.6 miles from the Serin Drive cell tower. First, this implies Bill traveled well beyond his assumed destination of Quail Mountain. Secondly, he was able to do so without his phone registering on the Verizon system anywhere in between (assuming he turned it on). Below is a screen capture from Google Earth showing the general area. Trails are in blue and various points of interest marked, including the 10.6 mile radius to the Serin Drive tower, in green. Overlaid onto this image is the “official” cell coverage shown by Verizon on their web site shortly after Bill’s hike. Due to the inaccuracies of the overlay process, it’s a close approximation. Note that this is all Verizon coverage from all nearby towers, not just the Serin Drive tower. Note that it is very difficult to get beyond Quail Mountain without passing through some area of Verizon coverage. Indeed, the upper slopes of Quail Mountain are very well covered. Again, this assumes Bill’s phone was on while in these zones. 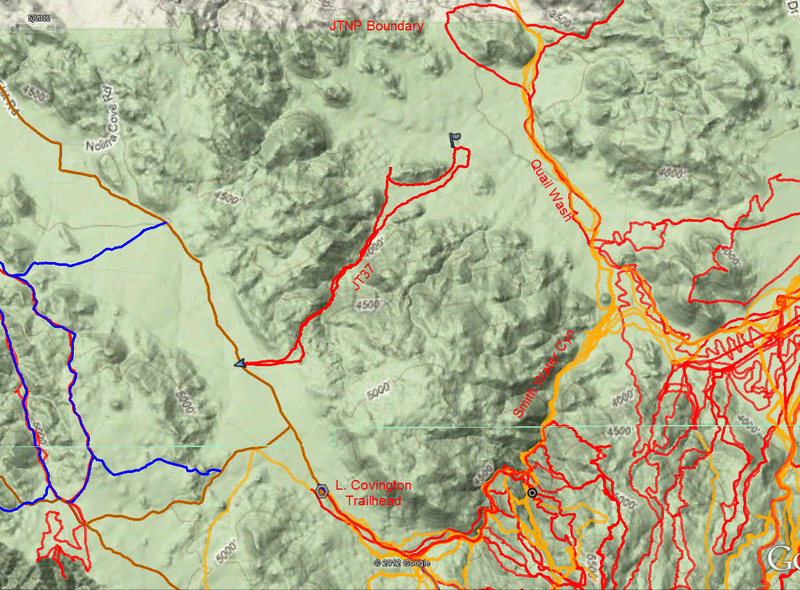 The only gap in the official Verizon coverage seems to coincide with the California Riding and Hiking Trail. This is the trail on which Bill is presumed to have started out towards Quail Mountain. 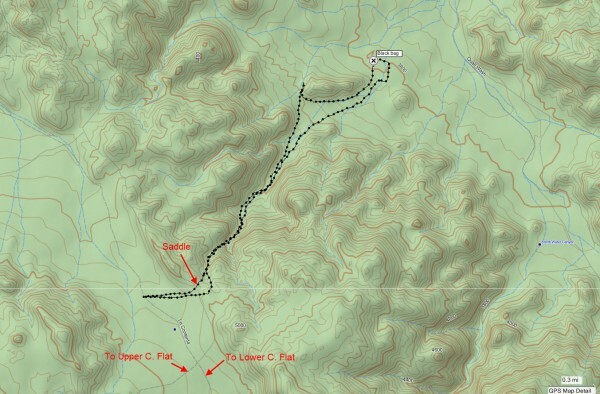 It continues on to the Lower Covington Flat trailhead or onto the Black Rock campground and Ranger Station. If Bill had, for reasons unknown, continued on the California Riding and Hiking Trail, he would have found a good dirt road at the Lower Covington Trailhead. The topography in the area is such that it’s impossible to miss the road. It seems obvious that upon reaching the dirt road, he would continue on it and there would be no reason to leave it. Perhaps there was a reason. I had recently done a little exploring of the Covington Flats area to improve my familiarity with it. In driving in and out on the La Contenta dirt road, I had been curious about two low saddles just easterly of the road, but never took the time to stop. They gave the sense of being a high point with a drop off and view on the other side. In particular there was a saddle just northeast of the intersection of the roads to Upper Covington and Lower Covington. It was a quarter mile walk from the road, but it looked closer, with not much elevation gain. Upon reaching the saddle I was very surprised. There was a canyon that descended northeasterly down toward Quail Wash, and I could see the houses just outside the park. They looked very close, perhaps a couple of miles, but I measured later it at about 4 miles. Interestingly, the distance from the saddle continuing along the dirt road to the nearest residential areas was over 5 miles. It looked like a doable route and the canyon not too steep. Were I in need of assistance, the temptation to descend towards those homes would be great. 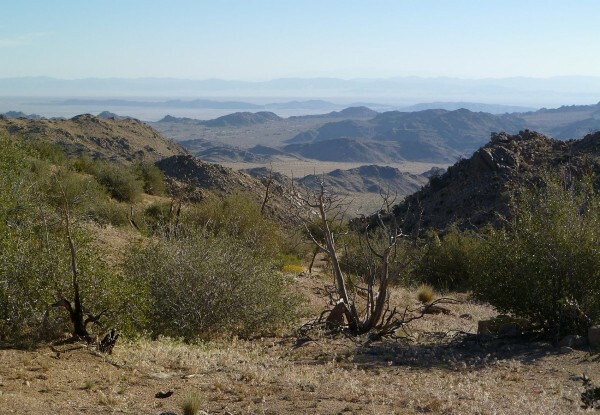 JT37, View northeasterly from Covington area saddle. Homes in distance. Given the amount of searching to date and the area covered, there’s a good possibility that Bill has done something unexpected and got himself out of the primary search area. This canyon presented itself as an unexpected, but possible, scenario. If Bill had continued on the Riding and Hiking Trail, he would not have pinged the Verizon system. Reaching the Lower Covington trailhead, he would have found a good dirt road upon which to continue. Clearly, the wise thing would be to stay on a good route, but if he had investigated the saddle he would have seen homes below to the northeast, apparently very near. It’s not possible to see the homes along La Contenta from this point. Further, looking at the cell coverage from the Serin Drive tower, there are areas of coverage just above this canyon, on the upper southerly slopes. It seems possible a reflected signal off this area could have resulted in the recorded ping, and the distance, considering the reflection, would have been in the ballpark. Somewhat steep terrain in the canyon, but passable. Found a great deal of dead mylar balloons on the alluvial fan at the canyon’s mouth. 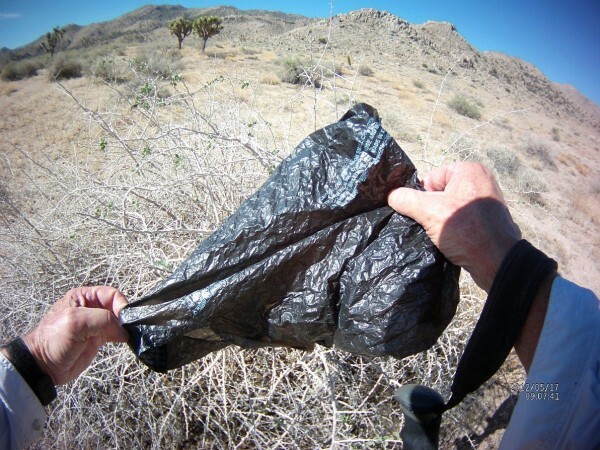 At the most northeasterly point of this trip, I noted a black plastic bag snagged on a bush (N34.06415, W116.28518). It appeared to be the type received when making purchases from a minimart. It was not as large as a supermarket plastic bag. Due to the proximity of the well used Quail Wash route about 0.6 miles to the east of the bag, it seems likely this was merely litter blown by the wind (although prevailing winds tend to blow towards Quail Wash). The bag appeared in fairly good condition and perhaps not consistent if it were in the elements for almost two years. Given that in previous trips we’ve found essentially zero trash items, seeing a bag was unusual. Coverage level: Very good in the canyon, 90%, on the alluvial fan at the canyon’s mouth, 80%. Perhaps because it fit the clues so well and this location seemed was so off the wall, I had the sense I could turn any corner here and come upon Bill on this trip. That’s only happened a couple of other times. I did this on a hot day and had to get in and out fast. Because of expected high temperatures, and a hard climb on the return back up the canyon, I limited my time exploring in the valley where I found the bag. The northerly park boundary was only about a mile away. Not knowing how much foot traffic happens from the residential area further north, I think the area northerly of my track and westerly of Quail Wash would be worth having a closer look at. There are probably much easier access points for this area than my route. 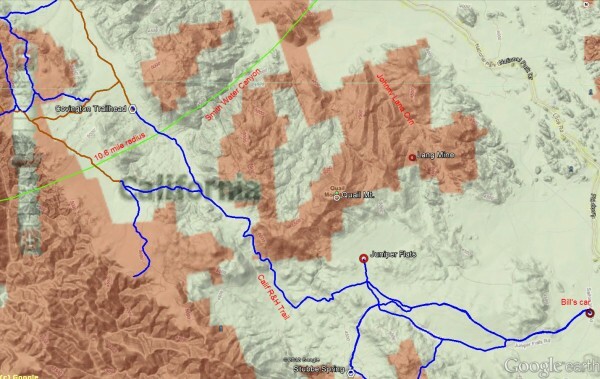 Patrick McCurdy and I covered a bit of the area on our JT25 search.